First round action. In the foreground Nic Wright takes on U130 winner Jack Healings, flanked by Sandra Blackburn and Pete Shaw who have already finished their game in which the well known "Ladies first" principle applied. 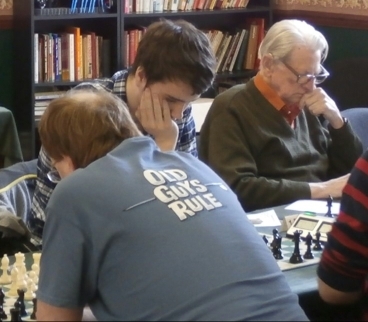 In the background Jacob "Stokie" Cartlidge, Glyn Valentine and Alex Cartlidge respectively take on Richard Szwajkun, Jon Blackburn and James Rothwell in the U160 section. Julian Hawthorne was in no doubt who was in charge as he bounced to the kangaroo prize. Facing the camera are U100 winner Simon Layhe (left) and Richard Martin. This year the mini congress found itself in April in its not entirely successful quest to avoid clashes with other events, but still achieved its regular entry of thirty-something. Most of the competitors have particpiated before, but there were also six debuts: Neville and Simon Layhe, Richard and Steve Szwajkun, Glyn Valentine and Rich Wiltshir who between them won three of the four sections. As ever it was good to see Newcastle old boys James Rothwell and Daniel Sullivan again. As ever I should give thanks to those who enabled and enhanced the congress: Jon and Sandra Blackburn who provided the refreshments, the fees for which formed the fund for the kangaroo prize; James Rothwell and the NSDCA who made generous donations; John Day who negotiated the use of the Bridge Club; Crewe and Kidsgrove chess clubs who loaned their digital clocks; and Alberto Gissi and James Rothwell who helped me return the Bridge Club to something resembling its normal state at the conclusion of hostilities. And of course all the players who set the tone of the event and made no demands on my limited arbiting abilities.